Bryan ISD Blog – Children First. Always. If there is a horse whisperer in Bryan, Texas, it may just be Evelyn Beesaw. As a recent graduate of Bryan High School, Evelyn will be one of the newest members of the Texas A&M University Equestrian Team in the fall. She has been riding and showing horses for more than half her life, but her love for horses began when she was just a few months old. She has won numerous riding awards over the years. Most recently, she was named the World Champion on her sister Claire’s horse at the Youth World Appaloosa Horse Show, as well as Reserve World Champion on her own horse, Dealer. Evelyn’s parents, Kristen and Kevin are both Bryan ISD employees and are very proud of their daughter’s drive to be the best. In addition to showing horses, Evelyn was vice president of the Bryan High School Choir, very active with the a capella group Vocal Legacy, and a member of both the National Honor Society and 4-H Club. She graduated in the top two percent of her class with an International Baccalaureate diploma. Evelyn plans to study biomedical sciences and become a doctor. Currently, she is looking forward to the next level of equestrian competition. The moment he picked up the guitar at 5 years-old, Kane Alvarado, fourth grade student at Fannin Elementary, realized playing it is what he wants to do. The 9-year-old guitar prodigy recently played the national anthem at Texas A&M baseball game, played at Gruene Hall and played at SXSW in Austin, for the third year straight. Kane is the youngest member of the Ernie Ball family. His mom, Cheri Garza-Alvarado, said music is always being played around the house. Kane plays guitar and lead vocals alongside his dad in a band called The Kane Alvarado Band. Cheri said the experience of watching her son and her husband play in the same band has been special. “It’s been really amazing to see the bond they’ve created not only as father and son but as musicians and bandmates,” she said. The Kane Alvarado Band practices in a home studio and is currently working on their own original music. One of Kane’s first bands he played in was called the Johnson Jammers. It was formed with Johnson Elementary classmates when he attended Johnson Elementary under the direction of Jamie Mosqueda. This school year is Kane’s first at Fannin Elementary. His principal Rebecca Ryberg said he is a worthy recipient of “I Am Bryan ISD” recognition. “He’s an amazing child,” Ryberg said. The District’s popular “I Am Bryan ISD” video series flourished this year with outstanding students and teachers. These individuals show what it means to represent Bryan ISD with talent, character and determination. A boxer, an MIT student, a linguist, a record-setting gymnast and a career educator have all been featured in the series over the past year. It’s clear that Bryan ISD students, teachers and alumni continue to represent the district well, including candidates not listed above. We look forward to seeing the new “I Bryan ISD” crop that emerges next school year. The halls, classrooms and kitchens at Rudder and Bryan High are dotted with career-ready cooks who produce flavorful dishes exceeding industry standards. Expectations in the kitchens are high. And the fact that these dishes are created by high school students instead of professional chefs makes no difference to the taste buds. The One Student, One Recipe video series offers a snapshot into the many the unique dishes created at Bryan ISD culinary programs on a daily basis. Local media and the community recognized the students’ achievements. You can relieve all of this year’s One Student, One Recipe videos below. Thanks to everyone who was involved in making the video series possible. We look forward to following (and eating 🙂 ) the delicious dishes coming out of the Rudder and Bryan High kitchens next year! Coach Rose Gregg arrives at Bryan High School at 5:35 a.m. every morning. The school’s start time is 8:15 a.m. Working as a special academic center teacher, she’s technically not a coach anymore. That doesn’t stop most people who know her from calling her “Coach Gregg” with love and admiration. 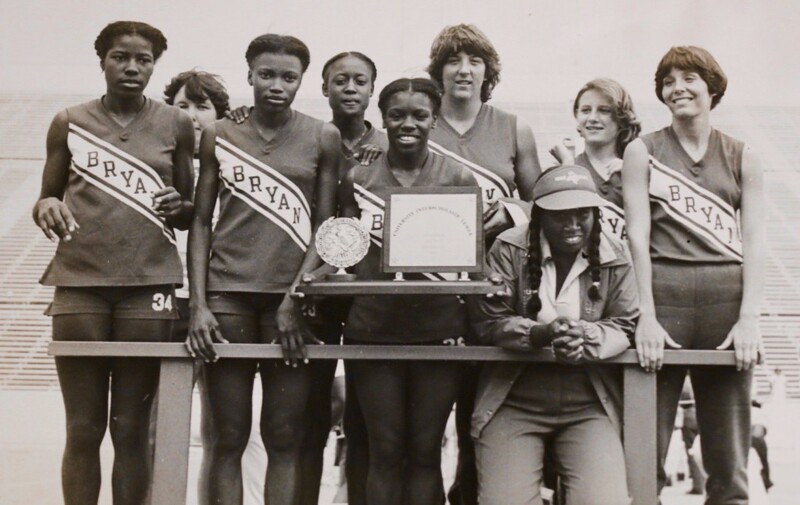 PROUD CHAMPIONS – Gregg crouches on the podium with the 1980 Bryan High Girls’ State Champion Track team. Gregg’s dedication to arriving at school “on-time” every day would be a remarkable feat in its own right. What makes it even more amazing is she’s arrived early to a Bryan ISD school nearly every school day for the last 51 years. And, she usually leaves school more than two hours after her school’s scheduled end time. If you want to know about a noteworthy event that’s occurred in Bryan over the past half century, Gregg’s a good person to start with. She’s seen integration, schools built, schools torn down, state championships won, state championships lost, academic success and lives changed. She’s seen it all. And she is thankful for it all. The students drive Gregg, and she drives them to be better. Last school year, Bryan ISD honored Gregg for 50 years of service in the school district. This year, Bryan ISD will honor Angie Krolczyk, TESC administrative assistant, and Judy Hughson, Kemp-Carver assistant principal, for their 50 years in the district. Many people would see such an accomplishment as the culmination of their career. Gregg sees it as a continuation. Like clockwork, she arrived two and a half hours early in August to start her 51st year in the same organization. Gregg said it all depends on her heath. She said if it gets to the point where she’s “not useful” that she’ll quit going to school because she doesn’t want to waste the students time, the district’s and her time. Growing up “up the road” in the small town of Calvert, TX, Gregg’s path didn’t seem like it was in line to be an educator. She didn’t think she would be able to go to college because she didn’t think her grades would be good enough. That mindset changed when someone told Gregg’s sister that her sister Rose wouldn’t ever make it in college. Gregg said she feels she proved that person wrong when she became the only girl in her high school class to graduate from college. Students, past students, fellow educators and community members appreciate the belief she has in them. When a photo was posted on Bryan ISD’s Facebook page last June of Gregg receiving an award for 50 years of service it received 873 “likes, loves and wows” and 141 comments, all of which were positive. Many people expressed their gratitude for the impact she had on their lives and for challenging them to accomplish their dreams. In her work as a track coach, cross country coach, basketball coach, volleyball coach, PE teacher, and teacher, Gregg influenced thousands of lives. Two Bryan ISD Board members, Ruthie Waller and Felicia Benford, remember Gregg fondly. Waller worked as a junior varsity track coach when Gregg started the first Bryan High girls’ track team in 1976 and won the state championship in 1980. Gregg coached Benford in basketball and track. It took a while for Benford to get accustomed to how hard Gregg pushed her to work, but she is thankful for the result. The work Gregg did outside of coaching is what Benford remembers most. Lester Banks, Bryan High campus monitor, described how Gregg didn’t let her sister Sharon quit track when she wanted to. Later, she received the “athlete of the year award” in track and is currently teaching at Rudder High School. On Facebook, Sam Pittman II thanked Gregg for “regularly visiting my grandmother in the nursing home.” Michele McKinley thanked her for serving as a mentor in her early teaching years.” Beverly Owen said Gregg went “beyond all that is expected of a teacher.” JoBeth Palmer said Gregg was “a major part” in developing her and her sister to what they are today. Accounts of lives changed go on and on, and are still continuing today. Lane Buban, Bryan High principal, sees Gregg as a “very valuable resource.” He said he goes to Gregg for advice because of her knowledge and experience. 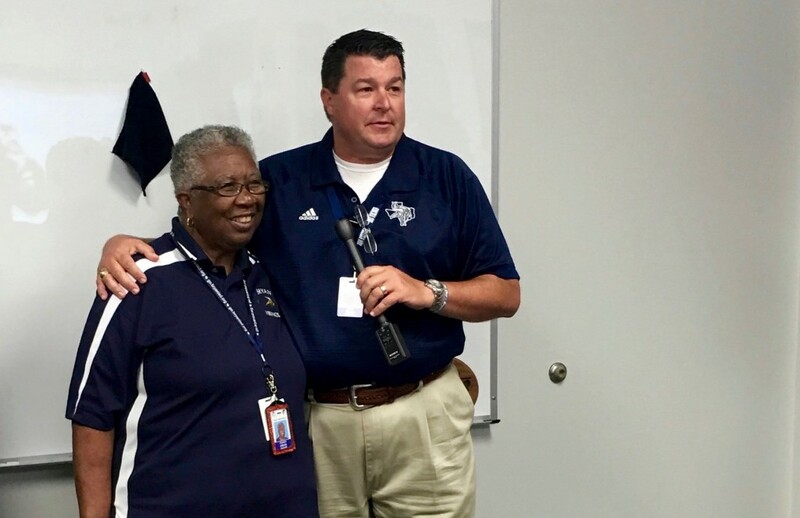 SMILING FACES – Bryan High Principal Lane Buban speaks glowingly about Coach Gregg at her 50 years of service presentation. As Gregg works to impact lives the same way she did on her first day of school at Neal Junior High on Sept. 1, 1966, she’s appreciative of the district that gave her a start in teaching. Heading into the thick of spring, Rudder and Bryan High students are developing their creativity and career prospects through floral design. 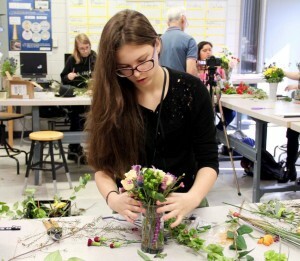 FINAL FITTING – A floral design student makes last minute changes to her floral arrangement. Part of FFA, floral design classes teach students skills they can use in a florist shop, a hobby business and many other industries. Rebecca Casey Ortiz, Rudder junior, is taking floral design classes for the first time this year and was recently offered a job with an event planning business arranging flowers for smaller events and dinners. “The things I’m learning in floral design, I’m able to apply in my job,” Ortiz said. 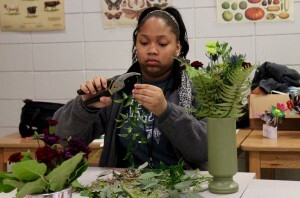 GREEN THUMB – Floral design students learn about all aspects of the plants they arrange. Michelle Knox, Ortiz’s floral design teacher at Rudder, said she is “out-shined” all the time by her students, which is something she loves. She said she is constantly reminded how students are growing in their skills. Knox started teaching floral design at Rudder in 2014, but she said the program has really “taken off” the last two years. 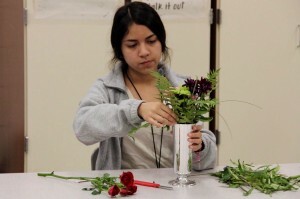 Next school year, advanced floral design classes will be offered at Rudder and Bryan High, bringing increased certification and competition opportunities and a possible floral club at Rudder. Barbara Volk-Tunnell, Bryan High floral design teacher, said students could get a high school floral certification or an art certification through floral design. FOCUSED PRECISION – A floral design student trims a plant to get the right fit for her arrangement. Her students have traveled all over the state for competitions related to horticulture and floral arrangements. Kamryn, Frenzel, one of Volk-Tunnel’s sophomore students, recently earned second place in the “Dining with a Texas Flair” competition at the Houston Livestock Show and Rodeo and walked away with $750 to use as she sees fit. Ola Thornhill, Bryan High sophomore, signed up for floral design because she wanted to learn something new. She quickly learned that the class involved more than she expected. CIRCLE OF MUSIC – Bach leader & organizer Laura Gonzalez, Bryan High junior, leads her students through a song. Playing the violin is her passion. Teaching it gives her joy. Seeing a kid smile when they learn a new song, get something right or learn how to hold a bow puts a smile on her face. She’s played music most of her life, but Laura Gonzalez, Bryan High junior, never realized its true impact until November when she formed the Bach String Academy for Bryan ISD elementary students. 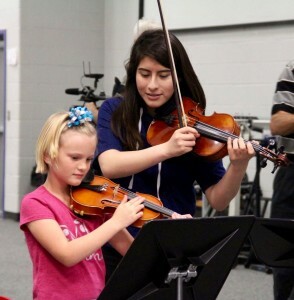 The student-led program, which offers violin lessons every Monday to elementary school students all over Bryan, blossomed out of an idea Gonzalez had for an International Baccalaureate, IB, service project. Creativity, activity, service, or CAS, are core requirements of the IB program Gonzales is enrolled in at Bryan High. Students have the option to choose how they will fulfill the requirements. Gonzalez took part in a free employee-led after-school string program when she was in elementary school, discovering its value. After a conversation about her idea with John Lemons, Bryan High orchestra director, Gonzalez gained confidence in her ability to organize a similar program. She approached a few of her fellow Bryan High orchestra students about helping her lead the program. Eventually, seven other violin students and a cello student joined her as volunteers. STUDENT TEACHER – A Bryan High orchestra student teaches the fundamentals of the violin. At the beginning of the school year, Gonzalez sent flyers home to elementary parents advertising free weekly string lessons. They didn’t know what to expect. Gonzalez said she expected to hear from a few parents who might be interested. However, when she arrived at the academy’s first information meeting on Oct. 24 a room full of eager parents and students greeted her. “At the beginning, we were just thinking maybe 15 kids, but overall we have around 33 kids,” Gonzalez said. To accommodate all of the students, Bach organizers divided the groups between “older and younger” students and made use of additional orchestra rooms. Students like Frei can get lessons from Bach String Academy for free. All they have to do is bring an instrument, which can be rented at local stores for a reasonable price. 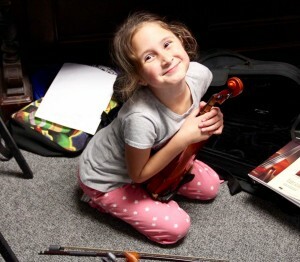 THE JOY OF MUSIC – A Bach String Academy student loves her violin. Frei’s mother Ashley said she was a little hesitant about her daughter getting music lessons because she didn’t want to commit to the money and extra time required without knowing if her daughter really interested. She’s since found out through the academy that her daughter is genuinely interested in playing the violin and she’s thankful for the opportunity. “Bach was able to give our family an opportunity to have music lessons and definitely not break the bank,” Ashley said. She’s thankful that the student organizers spend their free time to “give back.” Many of the organizers like Tomasita Ponce, Bryan High junior, are just as thankful to the elementary students for what they provide in return. When her elementary students struggle, Ponce said she tries to understand what they’re struggling with and talk to them in a way they helped her understand when she was their age. 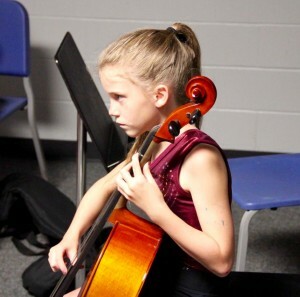 ATTENTIVE PLAYING – A Bach String student focuses intently on practicing her cello. Samantha Cruz, Bryan High junior, said the students developed a lot since the time they joined the academy. She said the students had to be taught the fundamentals, such as how to hold an instrument, know the parts of an instrument and read music. As everything comes together with the Bach program, the student organizers’ orchestra director John Lemons said the Bryan High orchestra is benefiting as well. Lemons said that he is proud of Gonzalez and all the other students that are helping her. Both of them plan to keep the student-led program going for many years to come. If you are interested in signing your child up for the Bach String Academy next year, there will be a parent information meeting in the fall where you can register your child. The time, date and location of the information meeting are not scheduled yet. A modern-day renaissance man walks through the halls of Bryan Collegiate. His friends know him as Eduardo Pecina. 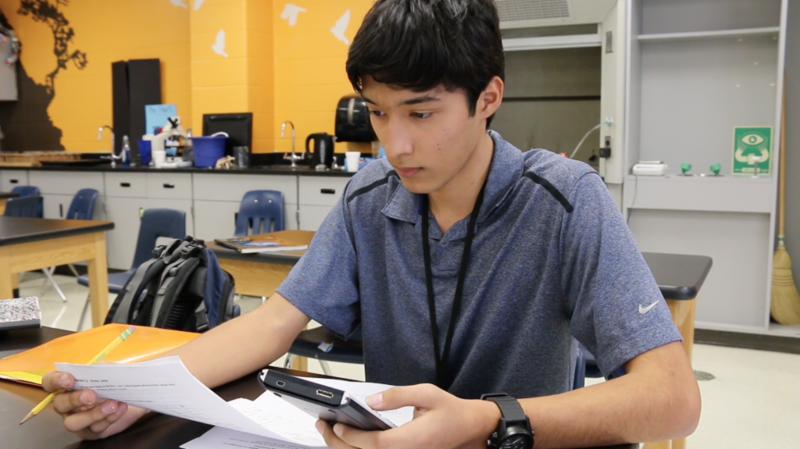 The Bryan Collegiate senior is fluent in English, Spanish, Chinese, Portuguese, French and Italian, is ranked 13 in his class with a 4.31 GPA, plays piano and recently designed a video game. When asked about his motivation, Pecina said, “I will never stop wanting to learn.” However, his quest for knowledge wasn’t always apparent. STUDYING HARD – Concentrating on finishing his last semester at Bryan Collegiate, Pecina is looking forward to attending Texas A&M University after graduation. When Pecina was in the third grade, his mom received a letter from his teacher saying Pecina was acting up in class and telling too many jokes. His mom wasn’t happy but soon realized his behavior was the result of being bored by lessons he previously learned at home. Pecina’s teacher recommended he learn something new after school to take his mind off of the work he sped through easily in school. His mom thought Chinese would be the perfect distraction. Pecina eventually gained the opportunity to travel to China last summer for the Texas A&M Confucius Institute’s Discovering China program. He developed several close friendships. Staying in contact with his Chinese friends also gives him the ability to practice speaking and writing their language. Chinese is actually the third language Pecina learned because he grew up in a multilingual home as a child of Mexican immigrants. His home life allowed him to learn English and Spanish at the same time in developing his first languages. Then, after he “climbed the steep hill” of learning Chinese, Pecina said other languages seem easier for him to start learning. Something that he is still passionate about doing because of the opportunities learning a new language opens. Bryan Collegiate Dean of Students Tommy Roberts said that learning foreign languages is a graduation requirement at any public high school, but he said the extent to which Pecina has “exceeded the requirements” by learning several additional languages is a testament to the kind of student he is. The feeling about Bryan Collegiate is mutual as Pecina said he loves how the school is a “small, close-knit community.” He said he built strong friendships at the school that will last forever. Bryan Collegiate requires 100 volunteer service hours to graduate, but Pecina said that’s not a problem for most students because they possess a built-in mentality to want to help. A man of many skills, Pecina chooses to use his language abilities to serve other by volunteering after school at the Bryan Adult Learning Center and Bryan Oak Grove United Methodist Church’s English as a Second Language program. Pecina said he helps people in all the languages he can. He’s helped people from Mexico, Spain, Brazil, China, Italy and he even helped someone from Russia learn Italian. 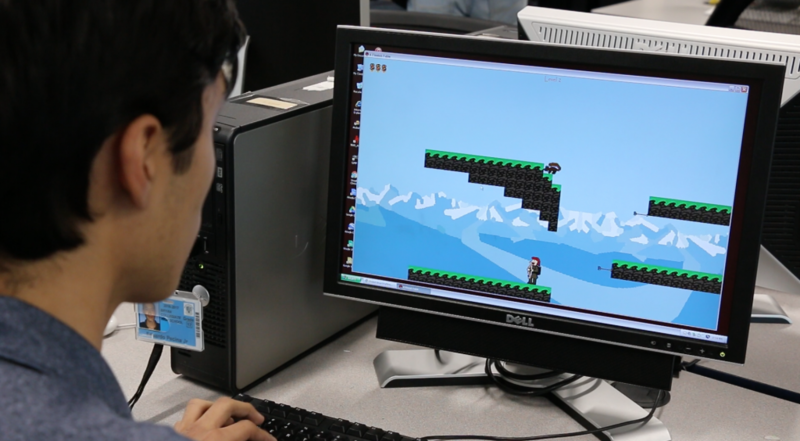 GAME MAKER – Pecina concentrates on playing a video game that he created. He coded the game, designed the graphics, created the music and voiced dialog. Pecina said he’s learned that you have to be a good student to be a good teacher. When he was in the eighth grade, he taught himself to code. Something that started as a challenge to his algebra teacher, when Pecina asked him what would happen if he got his calculator to solve a test itself. The teacher told Pecina that if he could do that it would mean he’s a good student and he wouldn’t care if he used a calculator on the test. Eventually, Pecina began practicing coding in the game Minecraft and participating in computer science UIL competitions. Recently, he created a full-length history-based video game called “A Finish Fable” that he said his little brother is addicted to. In designing the game Pecina had to combine several of his skills, including his dialect skills for the voice work, playing piano for the game’s music and creating graphics that he thinks gives the game a “retro” feel. Additionally, Pecina repairs electronic items and participates in school organizations, including serving as president of the National Honors Society at Bryan Collegiate. In September, he was selected as a National Merit Commended Student, meaning he was among the top five percent of more than 1.6 million students in the nation up for the honor. “A good planner” is the item Pecina said is the secret to balancing his busy schedule. Every night before he goes to sleep he plans out the day ahead of him. Pecina said his schedule can be exhausting at times when he doesn’t plan right, which leads to him “not sleeping well or eating well.” But, he said it gets better once you learn how to plan. After graduation, Pecina will enroll in the Honors Program at Texas A&M University, where plans on majoring in aerospace engineering. Because he attended summer school classes, Pecina will enter Texas A&M with more than the allotted 60 college credits students can earn at Bryan Collegiate in the fall and spring semesters through its partnership with Blinn College. As with all other aspects of his life, Pecina has a plan for post-secondary success. “After I finish my bachelor’s and master’s degrees I plan on starting my own company and continuing on to expand my knowledge,” Pecina said. Bryan Collegiate High School is a dual credit high school that partners with Blinn College to allow students the opportunity to simultaneously earn high school and college credit. Students select a university major they are interested in pursuing and follow a specific degree plan as they select Blinn courses. Students can earn an associate’s degree at the same time they earn their high school diploma. There are no fees associated with Bryan Collegiate, as Bryan ISD and Blinn College cover the full cost of Blinn tuition and books. If Briana Gonzalez receives a new belt at Davila Middle School’s Kickstart Kids belt ceremony 6 p.m. Dec. 14, it will be a proud moment for her and her family. However, the Davila Middle School seventh-grader said a new belt would only be an added benefit to what she has already gained from the Kickstart Kids program. EXPERIENTIAL LEARNING – Davila Middle School students practice kicking techniques. Gonzalez is currently participating in her second year of the non-profit in-school martial arts program that a group including Chuck Norris started in 1990. She said it provides her with the discipline necessary to respond to conflict. Something she said she struggled with in the past. Additionally, Gonzalez said the martial arts class increased her confidence and her grades. She credits her success to techniques taught in the class as well as guidance from Michael Cooper, Davila Middle School Kickstart Kids Instructor, who she said is willing to help her and her classmates with their problems. Cooper is one of two Bryan ISD Kickstart Kids instructors along with Teddy Coleman at Jane Long Middle School. Kickstart Kids arrived at Bryan ISD in 2010 at Davila under former instructor Rommel Gargoles. 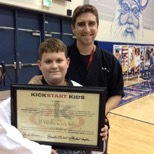 Coleman arrived the following year when Kickstart Kids came to Jane Long. Over the last six years, Coleman believes he has taught over 1,000 students. He is currently in charge of 256 students, and he said the program is still growing. Jane Long’s belt ceremony will be 6 p.m. Dec. 15 at the Jane Long big gym. 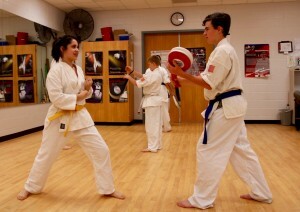 Many students join the program to learn martial arts techniques, but Cooper said they come out learning much more. “Punching and kicking is one thing, but the real structure of the family and the personality and self-esteem, that’s what we’re aiming for,” Cooper said. 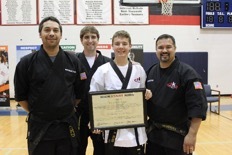 REACHING GOALS – Nicholas Rudd displays his black belt plaque with his instructors Teddy Coleman, Michael Cooper and Benjamin Mendez. Like Gonzalez, Jesse Rakowitz, Davila eighth-grader, said he struggled with anger issues before learning martial arts. He used to get into several fights before joining Kickstart Kids. Rakowitz said the program has helped him relax and deal with stress. Rackowitz currently has a blue belt and said he wants to advance all the way to 10th-degree black belt before he’s done, the highest martial arts rank. ACHIEVING DREAMS – Zachary Yeomans proudly holds a plaque commemorating black belt status with his instructor Michael Cooper. Last school year, two Bryan ISD students achieved the coveted rank of first-degree black belt. Nicholas Rudd, Bryan High 10th-grader, and Zachary Yeomans, Bryan High 11th-grader, stood before their peers at last year’s belt ceremony and received embroidered belts, new uniforms and plaques signed by Chuck Norris. By earning their black belts, Rudd and Yeomans earned the chance to compete with other Kickstart Kids students, perform on demonstration teams throughout Texas and mentor younger students as they become more advanced in the system. Kickstart Kids is an officially recognized program by the Texas Education Agency and teaches thousands of students at over 50 public schools in Texas. Coleman said the benefits of his program extend beyond his classroom, as he’s received positive feedback from parents and teachers about changes in the attitude and work ethic of students who enroll in his class. 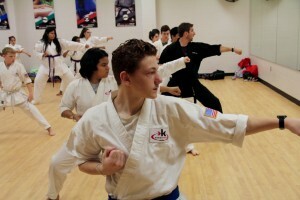 FOCUSED DETERMINATION – Davila eighth-grader Jesse Rakowitz practices punching techniques in his Kickstart Kids class. As parents and teachers observe great strides in students that go through the martial arts program, students recognize growth in themselves. Jane Long eighth-grader Gabby Saenz said she gained many benefits from being in the program. “I’d recommend Kickstart to anyone thinking of joining because it not only gives you physical health but also mental health,” Saenz said. “Self-respect and self-discipline are highlighted in posters on our wall, and we learn all those traits. Fruits of the $132 million bond election passed in November 2014, are developing around the district. Construction projects are on time and will be ready for the 2017-2018 school year, when a historic grade realignment is set to take place. Hammer, backhoe and drill sounds can be found all around Bryan ISD as building projects are coming together. The new press box at Merrill Green Stadium has been delighting fans during regular season games and playoff games. Sul Ross Elementary students, teachers and staff are enjoying the food coming out of their recently remodeled kitchen. And, SFA student-athletes are excelling in their newly refurbished gym. 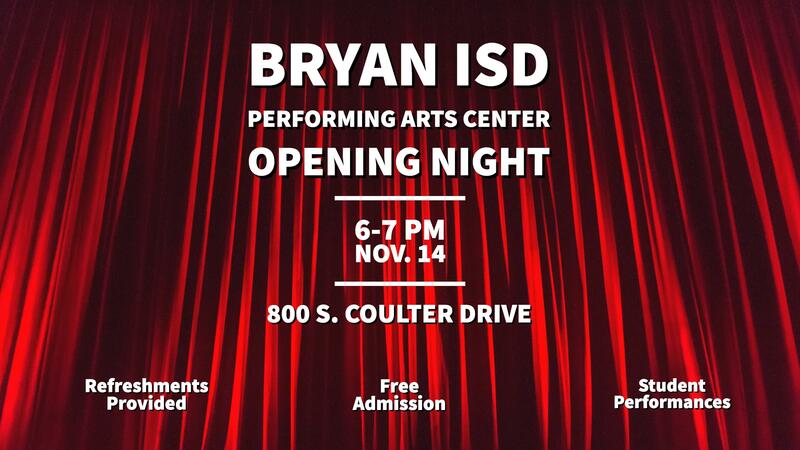 Additionally, the new Bryan ISD Performing Arts Center (PAC), once called the Bryan Civic Auditorium, opens at 6 p.m. tonight for a free grand-reopening performance at the historic building. GRAND REOPENING – Bryan ISD’s Performing Arts Center reopens at 6 p.m. tonight, celebrating a landmark new chapter for the old Bryan Civic Auditorium. 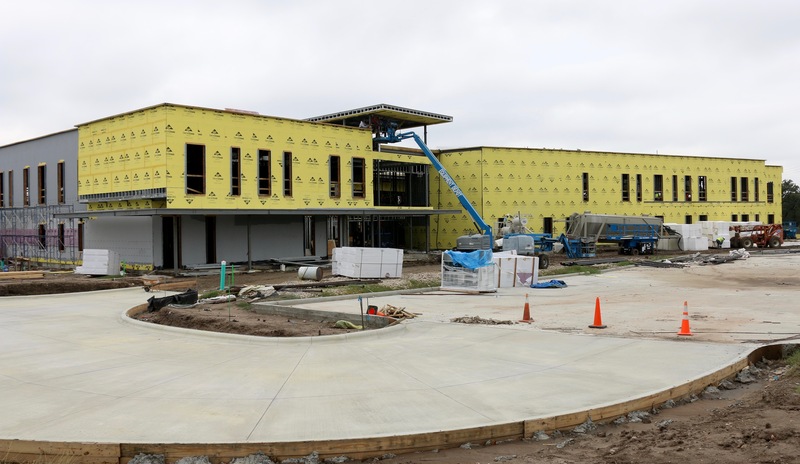 Upcoming projects to be completed in the spring include building additions and renovations at Henderson, Crockett, and Ross Elementary that are ahead of schedule. The quick progress will allow staff to begin moving in furniture to their new space in May before the projects are scheduled to be complete in the summer. Additionally, SFA Middle school staff are scheduled to start moving in their instructional materials in June. MOVING UP – Workers carefully construct a new section of Ross Elementary. Progressing quickly, the school looks different every day. Renovations at Rudder High School and classroom additions to Jane Long and Sam Rayburn Middle School were granted at the Oct. 17 board meeting. Those projects should progress on time if they follow the lead of all the other projects in the November 2014 bond election. That’s music to the ears of Jeff Windsor, director of construction. “Right now we’re rocking and rolling on everything we have,” Windsor said.